Lowood Bridge in the Borders. Lowood Bridge on the B6374 between Galashiels and Melrose, will close for up to 20 weeks next year. In 2016, the bridge was closed temporarily as tests on the structure were carried out. A presentation by Scottish Borders Council’s design services manger Paul Frankland and assets manager David Richardson to Melrose Community Council last week showed the extent of the damage found on the category B listed bridge. The bridge requires some essential masonry work carried out, stitching of cracks in the arches, scour works to the central pier, repairing of mortar and a rebuild of the parapet walls, which are leaning out. Also required are ecological and bat surveys, as well as locating water and gas mains, which are carried by the bridge. Mr Frankland added: “We are looking at doing this in one phase of works – and it is expected to take between 16-20 weeks. The cost of repairs to the bridge, which would conclude with the resurfacing of its deck, is expected to cost in the region of £640,000 – and after the repairs are completed, the 26-tonne weight limit imposed last year will be lifted. Another main route between Galashiels and Melrose, Galafoot Bridge on the A6091, is also set to close for a period next year for bridge deck refurbishment, and Mr Frankland said it was important that the two repairs did not run concurrently, and that the council will be liasing with Amey – which is reponsible for the Galafoot Bridge – on the matter. 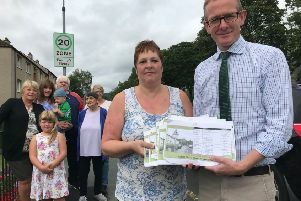 Councillor David Parker said: “We are in discussions with Amey, and I think it’s more than likely that Galafoot works will begin in February, and the Lowood Bridge in June.